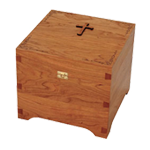 Every Trappist Casket features a removable Keepsake Cross that is precisely cut to fit into a recess on the lid. 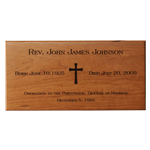 These hardwood crosses are offered to loved ones to keep as a memento. As an option, they can be engraved in memory of the deceased. 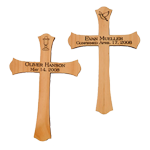 Additional Keepsake Crosses, identically engraved if desired, can be purchased to give to family members and friends on this or any occasion: baptism, first communion, birthday, confirmation, wedding or anniversary. 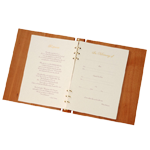 The name of each person buried in one of our caskets or urns is inscribed in our Memorial Book placed in the chapel at Trappist Caskets. As a living memorial, a tree seedling is planted in the monastic forest on the Abbey grounds as our way to honor your loved one and to give back to the earth. This planting is consecrated with a special blessing. 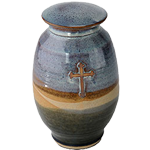 A Mass is celebrated in memory of those who use one of our blessed vessels for their final repose. If you are planning for future use – please fill out and send in an Advanced Planning Order Form. Your purchase will be reserved until you need it. Each year, Americans grapple with many questions as they spend billions of dollars arranging funerals for family members and friends. Don’t be discouraged in what you hear from your funeral home. 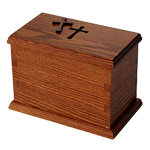 You have options at Trappist Caskets. 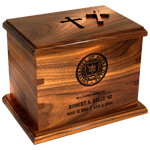 We offer finely-detailed, custom laser engraving on our caskets and wooden urns, adding character to your purchase and, hopefully, a level of closure for family and friends. This is done just prior to shipping, even for immediate deliveries. You might be wondering how we can be so responsive, especially where there is an immediate need. We’ve been doing this for a long time and we are confident we can accommodate just about any schedule. 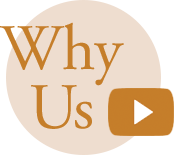 If you have questions, read through our FAQs. And if you don’t find the answers you are looking for, please call. Let us call you during our regular business hours.